Blooming with beauty, Mun’s No. 11 Anarose Rejuvenating Rose Toner is the exfoliating toner I reach for when my skin needs a bit of gentle refinement. As a bit of a toner addict, I like having several options for morning and evening mists. For mornings and throughout the day, I look for moisturizing toners that prep my skin for makeup and refresh said makeup throughout the day. For evenings, I prefer exfoliating toners that deep clean while delivering moisture and prepping my skin for acne serums. Mun’s No. 11 Anarose Rejuvenating Rose Toner can easily be a morning or evening toner thanks to its extremely gentle and nourishing ingredients — think rose water, aloe leaf juice and moisture-binding hyaluronic acid. But for my skin, it really shines as an evening treatment, with pore-cleansing willow bark extract and calming florals, including Bulgarian rose, jasmine and daisy extracts. In addition to these balancing ingredients, Mun’s No. 11 Anarose Rejuvenating Rose Toner takes advantage of prickly pear stem extract, which is full of amino acids and antioxidants to boost radiance and resilience. As you may remember, Mun’s hero product, the N0. 1 Aknari Brightening Youth Serum, contains the vitamin E-rich prickly pear seed oil, making the rose toner a perfect companion to your well-edited skincare routine. While the serum is rich with the scent of roses, the toner has a lighter touch, keeping the olfactory experience well-designed. Speaking of design, when Mun No. 11 Anarose Rejuvenating Rose Toner first launched, the Miron glass had only a screw-top lid, meaning this toner was meant to be poured onto a cotton pad and gently swiped across the face and neck. I’ll be the first to say that I fully prefer fine misting toners, but for this one in particular, because it has some gentle exfoliating properties thanks to willow bark, I actually enjoyed the ritual of using this toner with a cotton pad. In recent months, Mun has introduced an additional spray-top to go with the toner (so you have a choice of spraying or pouring). I’ve put the spray top on mine, as pictured, but I have to say that it’s really better as a swipe-across-your-face toner. This is because the spray tops for these violet glass jars just aren’t that great — the mists are a little too “wet” though not terribly targeted (that’s a good thing). Perhaps the idea of spraying your face and then using a cotton round to disperse everything is the idea here? Whatever it is, it’s more on the glass company to innovate a bit with the packaging; but, having the option is nice, and it shows that Mun heard those who prefer a mist! All in all, this is a fantastic toner that I have happily repurchased twice after receiving a complimentary bottle for review. If you’d prefer to have one go-to toner for day and night (instead of being a toner hoarder like me — I like options, OK?) Mun No. 11 Anarose Rejuvenating Rose Toner is definitely one to consider and one I highly recommend. If you’re ready to grab a bottle for yourself, I’ve got a discount code for you! Shop on Mun’s site and use code “kimberlylocmun” for 15% off! You can also find Mun’s toner at The Detox Market and Integrity Botanicals as well as Spirit Beauty Lounge. 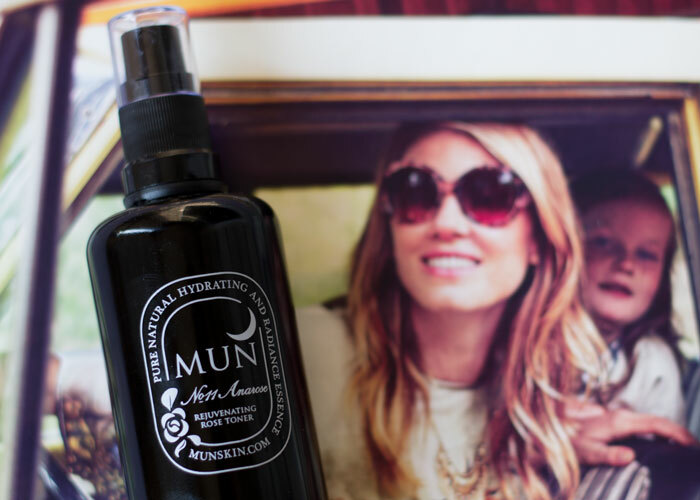 Have you tried Mun’s toner? Do you have any Miron glass toners with spray tops? If so, what do you think of them? How do you prefer to tone your skin — with sprays or with a cotton round? Tell me in the comments section!